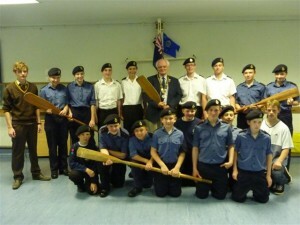 June 2012 – On June 6th at the Gravesend Sea Cadets parade Brian Portway President of the Rotary Club of Gravesend presented the Commanding Officer with a cheque for £640 towards the cost of improved workshop and training facilities. An ex-shipping container will be turned into a modern up to date dual facility unit used to maintain essential equipment and to teach the cadets basic skills in engineering and training. As material is delivered on site, Gravesend Rotarians will be helping out in construction and fitting out work which.has been funded both by local when over 900 cyclists took part in this years annual “On Your Bike” sponsored fun ride; and also by members of the Rotary Club of Gravesend who have given their time and expertise in the planning and submission of project details to the relevant authorities and also ensuring that Rotary District fund holders requirements were met.